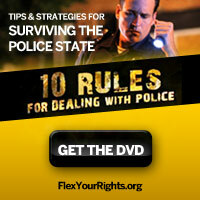 Click on the banner to purchase copies of the 10 Rules for Dealing with Police DVD, for yourself and your friends! Thanks to our new affiliate partnership with Flex Your Rights, your purchase will support both organizations! Post the link on your web sites, FaceBook and Twitter pages, and in emails, to spread the word and help the cause. A pro-legalization US representative was the keynote speaker at the NORML conference in Denver Saturday. He said we're on the cusp of victory. Drug legalizing presidential nomination candidates on the right: Gary Johnson and Ron Paul enter the fray. Cops ripping off drug dealers, cops offering information to drug defendants, sheriffs escorting cartel dope loads, and, oh, yes, prison guards gone bad. More mass graves have been found, and the gruesome killings continue. Although Dutch policy only allows you to possess five grams of marijuana, the high court has ruled that you can still grow five plants, no matter the yield.